Today’s round was a truly insane. 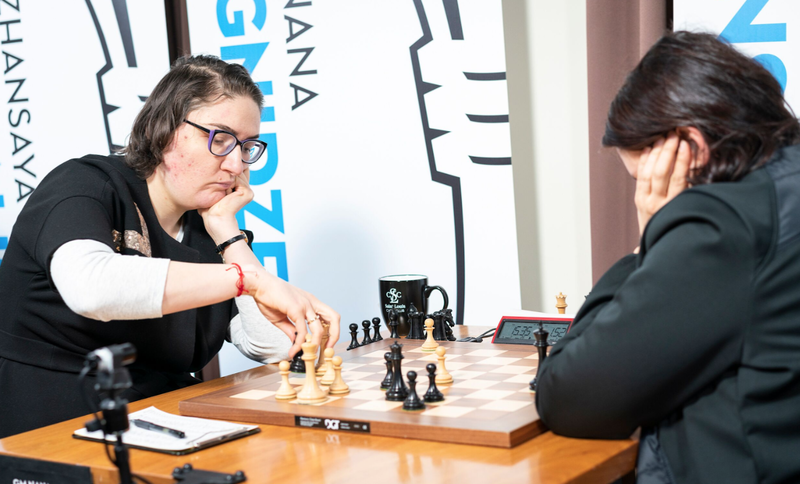 Krush and Kosteniuk drew an unclear game where both had chances, and the games Gunina-Paehtz, Dronavalli-Abdumalik, and Dzagnidze-Zatonskih all had many changes in evaluation throughout the game. Watching it live was a real edge-of-your-seat experience! Here are the results and a breakdown of today’s action. Kosteniuk played the sharp 4… c5 line against a Qc2 Nimzo, but it was clear that she wasn’t as well prepared against the particular line that Krush chose. Irina got a seemingly comfortable edge out of the opening, but Alexandra still managed to create a complex fight. Black managed to damage White’s kingside pawn structure, and after that, it was clear only Kosteniuk could be better, but once queens came off White’s superior queenside an active rook gave Krush enough counterplay. Once she grabbed the pawn on a7, Alexandra sensibly forced a perpetual. 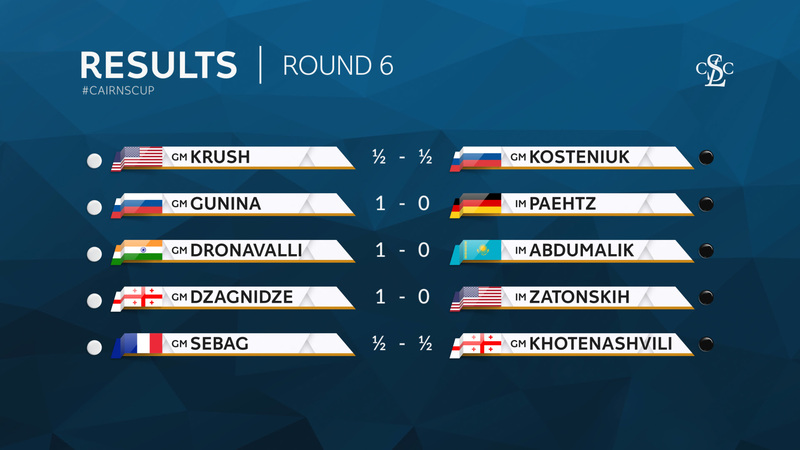 Both players definitely had their chances, but in the end the standings remain unchanged, with Kosteniuk half a point ahead. 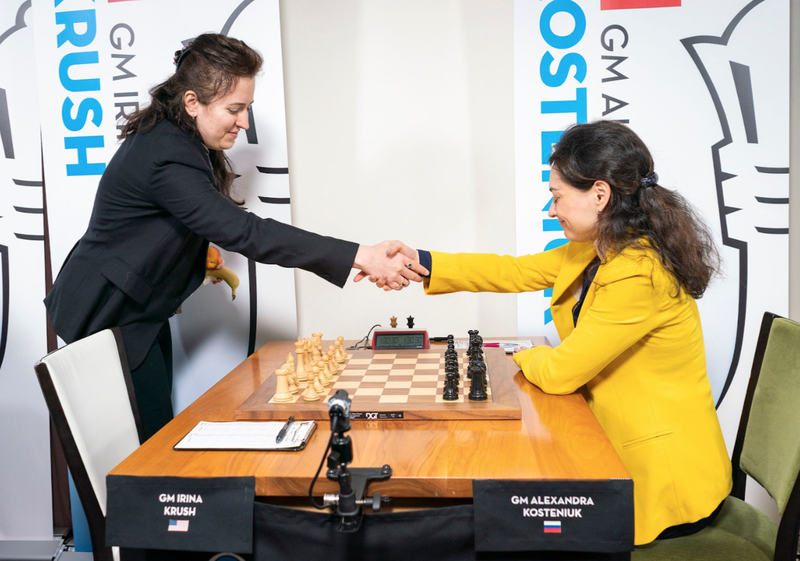 As she was in her other games, Valentina was clearly ready for a complicated fight, and she signaled as much by spending a lot of time on the unclear 8. Bg5 in the opening instead of the more standard capture on d4. It seemed to pay off for her, as she won the pawn back soon anyway and ended up with a small, but stable advantage. Once Elisabeth was provoked into playing c6, it was clear she was going to suffer for a long time, and commentator Yasser Seirawan even went as far as to say the position was practically lost. Paehtz defended admirably, however, and Gunina perhaps erred by deciding to trade off the queens. After this, the d6 weakness was a lot easier to cover, and the position liquidated to a dead drawn rook ending. Elisabeth made life more complicated for herself when she banked her draw on the passed c-pawn. Once Valentina captured her kingside and blockaded that pawn, she showed excellent technique to bring the point home. 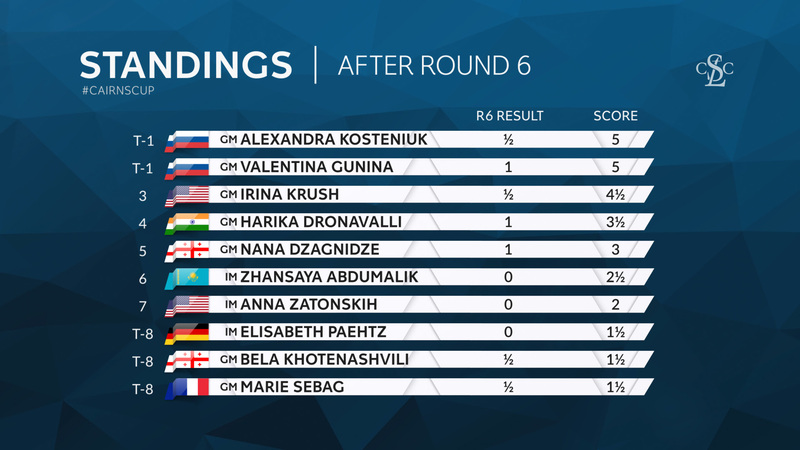 This win puts Gunina tied for first with Kosteniuk, while Paehtz still has yet to pick up a win. A quiet Guicco Piano lead to a position where all the bishops were traded. From here, a maneuvering battle commenced, where both players tried to find good squares for their knights. Harika definitely got the better of her less experienced opponent during the phase, and slowly improved her pieces and gained space. Zhansaya, meanwhile, seemed to not have a clear plan and was unable to improve her position very much. A strange occurrence happened right after time trouble, however, when Harika allowed a three-fold and Abdumalik didn’t take it. This proved to be a genius move as the Indian GM played f4 at the wrong moment and soon ended up worse. Things went from bad to worse for White, and Zhansaya completely took over the position. As was the case many times today, though, this turned out not to be the end of the tale. Abdumalik allowed the advantage to dissipate with a couple of errors, then blundered by allowing Harika’s rooks to enter the 7th rank. After this, the Indian GM was completely unforgiving. Harika’s first win of the event, and a disappointing result for Zhansaya, who definitely will be unhappy about her blown chances. Nana’s choice of cxd3 and, in particular, 10. E4 looked quite risky for her, and Anna got a very comfortable edge out of the opening. Anna’s Kf8-Nd7 unnecessarily complicated the game, and after that, it was difficult to say which side should be preferred. Positionally White’s game always looked unpleasant, but the black king proved to be a big problem for Anna. Time pressure also entered the fray, as neither player had much time by move 30. Nana’s play on the b-file wasn’t bad, but once the American put her king on e7 a second time her position was suddenly busted. With mere seconds on the clock for both players in a crazy position, however, there were many blunders traded back and forth. After time control, they reached a roughly balanced position, but it was still quite complicated, and Anna allowed her knight to get trapped on e1. Nana converted the queen ending convincingly, and thus moves back to 50%. Anna’s time pressure woes continue, and American fans hope she can figure things out before the end of the event. The French GM chose the same 9. Bd2 move in a 4 knights that she played against Kosteniuk earlier in the event. While she didn’t get a bad position as she did in that game, Bela didn’t seem to have any troubles equalizing. The game traded into an endgame where White compensated for her pawn’s weaknesses, and it looked as though a draw was inevitable. The players eventually liquidated into a rook ending, and a draw was reached shortly. A nice solid game, which was in fact Bela’s first draw, but I’m curious if Marie will choose this system again. Here are the standings after round 6. Gunina moves into a tie for first, and Harika moves into the plus column with her first win. Below are the pairings for round 7. Kosteniuk-Dronavalli will be a key game to watch, as it could have a big impact on the standings. 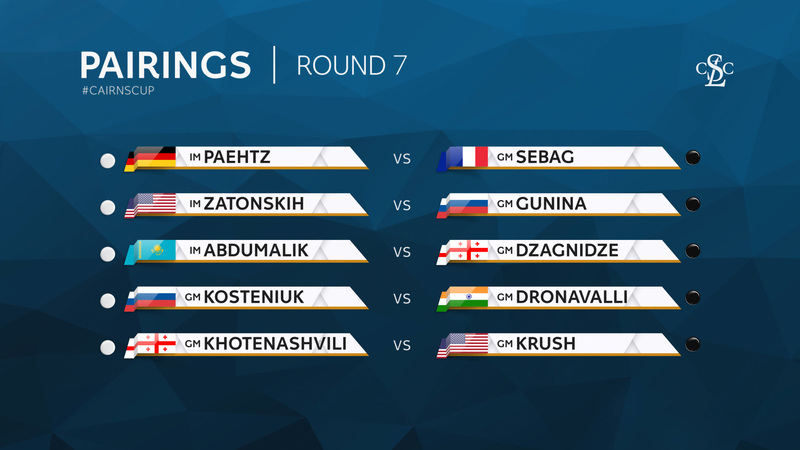 Check out all the action on uschesschamps.com tomorrow at 1pm.